In brief: We finally make it to the newly (ish) opened cafe of Russ & Daughters and are pleased with the results. 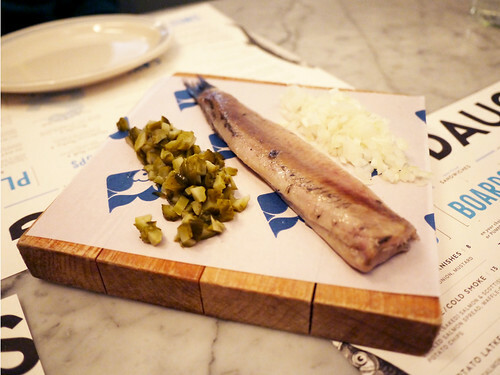 Pickled herring and cold appetizers is not exactly cold weather fare, or is it, but the new Russ and Daughters Cafe is so charming and weirdly old/new school, that we didn't even notice the arctic temps outside. I loved everything we tried, the rye bread, the chopped liver, the divine matzoh ball soup, the Holland herring, the latkes and even the knishes. The only thing trouble with old school charm is the service is slower than you might want if you had to get back to work. This is a place I wish were in my neighborhood where I could pop by anytime for a perfect bowl of matzoh ball soup and a plate of chopped liver. OMG. I think it's amazing that a place that old school is expanding into new locations. This is on the list for our next nyc trip! That cafe is decades overdue!! In flatiron i'm sure you could get matzo ball soup delivered from 2nd ave deli- just be sure to ask they pack the matzo ball seperate so it doesn't get soggy in transit.